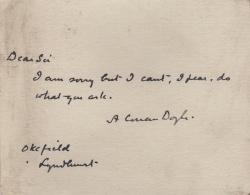 This letter was written by Arthur Conan Doyle in 1924 to Patrick Braybrooke. I am sorry but I can't, I fear, do what you ask. This page was last edited on 8 November 2018, at 19:23.